Do You Know Where To Get A Replacement Owner's Manual For Your RV? Should We Put A Cover On Our New Travel Trailer? I Need An Owner's Manual For My RV Where Can I Find One? What's The Funniest Thing That Ever Happened To You When You Were RVing And Camping? What Is Your Favorite RVing Destination? Want to share our paper and website with others or contribute your own article? As usual our Ask An RV Question section has been very busy the last few months. We have received numerous questions. Take a look below at some of the questions we have received. I Shorted Out The Electrical System On My Travel Trailer, HELP!!! If you have questions about RVs, RVing or the RVing Lifestyle? You can ask them now. If you would like to view more of the questions we have been asked, or leave a comment, you can find the questions already asked directly under the Ask An RV Question Form. We urge your participation. We have a new 09 trailer and are wondering if a cover is a good thing in the winter or does it damage the finish by banging in the wind? GAFFNEY, S.C. – October 15, 2009 – This season, forget the “staycation.” Take a road trip of a lifetime on Freightliner Custom Chassis. Motorhome enthusiasts who have waited out the bumpy road of a rough economy to buy a new rig now have 1,250 reasons to start planning their next road trip immediately in a new RV. Called “Fueled By Us,” Freightliner Custom Chassis Corporation (FCCC) is offering a $1,250 USD fuel card with the purchase of any qualifying new motorhome built on a Freightliner chassis from dealers in the United States and Canada. The Fueled By Us offer is available from Oct. 15 - Dec. 31. For more information and details about the Fueled By Us offer, visit www.freightlinerchassis.com/fuel. 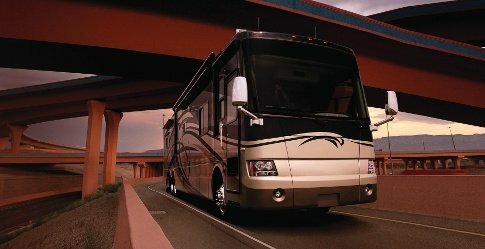 Freightliner chassis power some of the most popular and well-built Class A motorhomes available in the industry. The following manufacturers are participating in the Fueled By Us program: Damon, Entegra Coach, Forest River, Gulf Stream, Itasca, Jayco, Four Winds International (formerly known as Mandalay Coach), Newmar, Sportscoach, Tiffin, Triple E and Winnebago. FCCC’s Fueled By Us offer applies to new 2008, 2009 and 2010 model-year retail-sold motorhomes built by the aforementioned participating manufacturers on FCCC chassis. FCCC manufactures diesel powered chassis and even offers the first-of-its-kind hybrid-electric version called ecoFRED, designed to increase fuel economy while delivering optimal power. Qualified Fueled by Us participants receive a Visa debit card pre-loaded with $1,250 that can be used at any diesel fueling station across the country where Visa is accepted. About The Author: Freightliner Custom Chassis Corporation manufactures premium chassis for the motor-home, delivery walk-in van, and school bus and shuttle bus markets. Freightliner Custom Chassis Corporation is a subsidiary of Daimler Trucks North America LLC, a Daimler company. FCCC is looking for motorhome enthusiasts to share ideas and photos for where they would go on their next great adventure on Facebook at http://bit.ly/1dAcGT. I cannot tell you how many times this question is submitted to me each week. Let me start off by saying that trying to find an Owner's Manual for an RV is harder than finding a needle in a haystack. But there are some steps you can take to make your hunt easier. 1. If the company that manufactured your RV is still in business; you should contact them first. Some RV Manufacturers actually have sections on their websites where you can download Owner's Manuals for previous models of their RVs for free. Others require that you contact them by e-mail and they will either send you a copy or let you download a copy of the Owner's Manual for a small fee. Other RV Manufacturers may require you to order the Owner's Manual through a local RV Dealerships parts department and yes, some RV Manufacturers do not even have copies of Owner's Manuals at all. 2. If you cannot get a copy from the manufacturer I suggest that you pay a visit to RVing - The Midwest Connection: This website has a Manual Request Section where you can post a request for an Owner's Manual for any brand, year or type of RV. 3. Join an RV Forum that is specific to your brand of RV. You can then post a request for the Owner's Manual on the forum and see if any of the other members can help you out. 4. Search For RV Owner's Manuals On eBay: Some RV owners have had good luck in finding RV Owner's Manuals here. Of course you are going to have to purchase the manual. Woodall's RV Owner's Handbook: In fact right now you can Save nearly 50% off the cover price on the NEW Woodall's RV Owner's Handbook! The RV Handbook: Essential How-to Guide for the RV Owner, 3rd Edition By Bill Estes. RV Repair and Maintenance Manual: Updated and Expanded By Bob Livingston. We also have a Fan Page on Facebook. All RVers and Campers have had funny things happen to them while RVing and Camping. Here is your opportunity to share your story about the funniest thing that ever happened to you while camping and RVing with other RVers and Campers. Just visit our Funny RVing Stories page and tell us all about it. If your story is really, really funny, we may even publish it in a issue of the Everything About RVing Gazette. If it helps you can even add a picture to your story. Don't forget to read our Submission Guidelines before submitting your story. All RVers have a favorite place they like to go. Now it is time for you to tell us all about your favorite RVing destination. It does not have to be about a campground; it can be about any place you like to visit when RVing. Just let us know what we should not miss when visiting your favorite destination. It's easy and it is fun. Just go to our What Is Your Favorite RVing Or Camping Destination page and tell us all about it. You can even add a picture if you want. You never know if your story is good enough, we may even publish it in our next issue of the EARV Gazette. Don't forget to read our Submission Guidelines before submitting your story. Here is your opportunity to share your Love of RVing with others. We have a lot of visitors to our site who have never RVed before. You now have the opportunity to let them know what they are missing by not being a part of the RVing Lifestyle. We urge you to share Your RVing Love Story. If you want you can even add a picture of your RV to the story. It's easy and it is fun. Just go to our Tell Us What You Love About RVing Page and tell us all about it. You can even add a picture if you want. Don't forget to read our Submission Guidelines before submitting your story. Would you like stay up to date on everything that is going on in the Wonderful World Of RVing? I if so, subscribe to our RVers Blog. If you would like to become a reporter for/or contribute articles to The Gazette or The RV Lifestyle Articles section of the website visit the Submit An Article page. If you own a website and would like to add a link to Everything About RVing on your site, please visit the Share Our Site page. Do you have any comments, feedback or ideas?